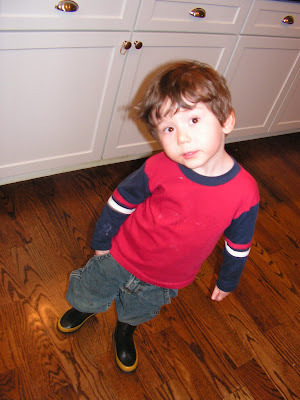 It's hard to believe that Asher turned 3 on March 12th! 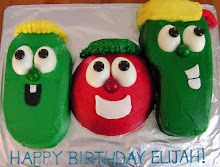 We have been celebrating his birthday in many ways over the past week. 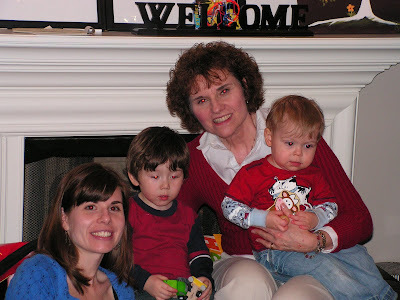 Since Asher doesn't like large groups, I had our neighborhood playgroup friends over for a lunch and firetruck cookies. On the day of his birthday, Asher wanted to eat at Pie in the Sky so just our immediate family took him there and we ended with cupcakes from The Cupcake Collection (a local cupcake shop a couple of blocks from our house!). 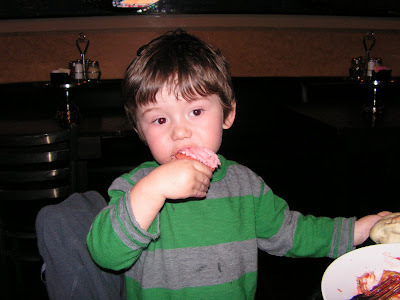 Below is Asher enjoying the the cupcake at Pie in the Sky. My mom and stepdad, Bruce, and my aunt Candy all traveled down this past weekend for us to have an extended family party for Asher. David's mom and his brother's family all joined us as well. 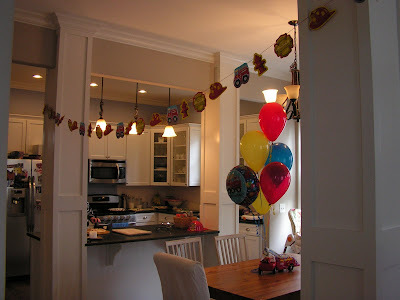 We had taken Asher to the party store to decide the theme of his birhtday this year. 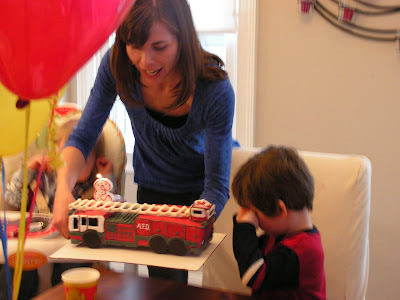 It came down to Thomas the Train or firetrucks and he chose firetrucks. 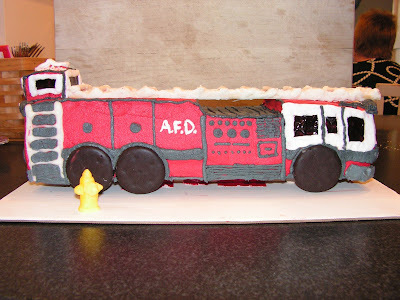 I asked Asher if he wanted a hook and ladder truck or a pumper truck for his cake. He went for the hook and ladder. David said it was funny that we even know the different types of firetrucks. We are singing "Happy Birthday" to Asher and you can tell he wishes he could disappear. He definitely does NOT want to be the center of attention. Jonas thought that he would get into the mix of opening presents. I suppose he figures that he will get to play with them as much as Asher. Elijah (Asher's cousin)is dressed up in Asher's firejacket. I was thankful that my mom was able to come for the party. It was nice to have her help, along with my aunt's and even step-dad's (who helped me put together the ladder for the cake) to make the party a success. 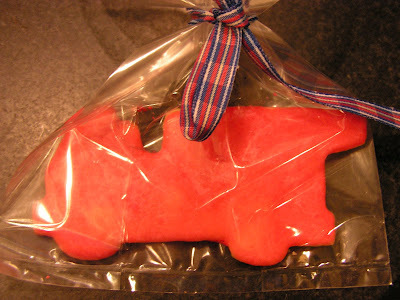 For our goodie bags, we gave everyone an iced sugar cookie of a firetruck. 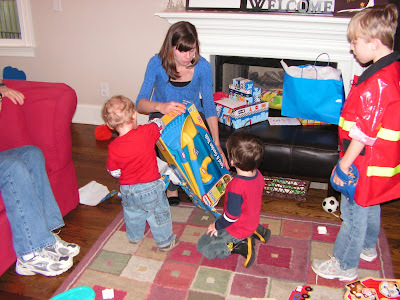 It was such a special time to celebrate Asher's three years of life. I am so thankful for him and all the ways he has changed our lives! 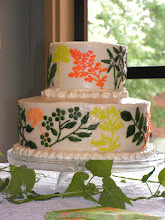 This is an AMAZING cake! I'm totally impressed and yet not surprised at all! I am so thankful I have gotten to know Asher this past year. He is a special little boy. How fun that he got to celebrate for an entire week!